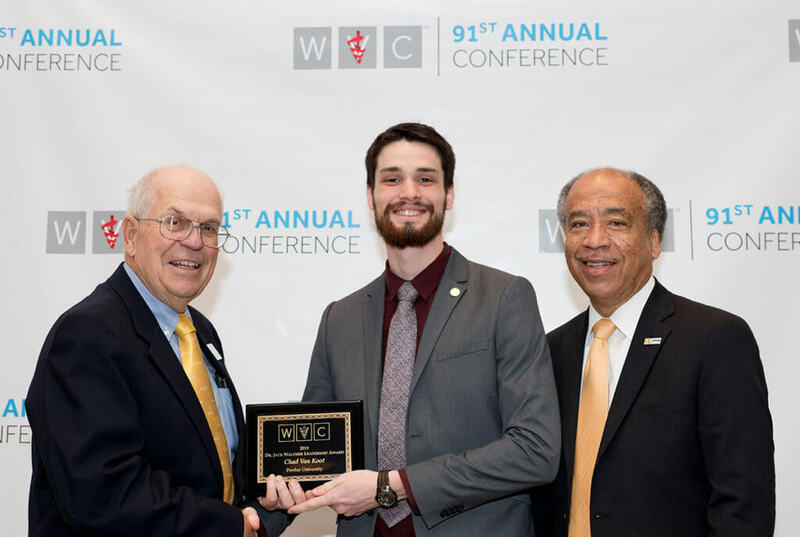 Outgoing WVC President Darwin Yoder presented the Dr. Jack Walther Leadership Award to third-year Purdue veterinary student Chad Van Koot, who was joined by Dean Willie Reed at the 2019 Leadership Award Breakfast held on February 19 as part of the WVC Conference in Las Vegas. Chad Van Koot, of the DVM Class of 2020, was honored as one of 37 DVM students selected to receive the Dr. Jack Walther Leadership Award, presented by the WVC. The award recognizes veterinary students who display leadership values at their respective schools or colleges. The recipients were honored at the WVC annual convention held February 17-20 at the Mandalay Bay Convention Center in Las Vegas, Nev. The award is for third-year veterinary students attending AVMA-accredited colleges or schools and two veterinary technician students. The recipients are chosen by their respective institutions for their leadership skills and service to the veterinary profession. The scholarship consists of a $1,000 stipend as well as complimentary registration, lodging, airfare, meal vouchers, and a $250 travel allowance to attend the WVC annual convention. Recipients also are entitled to one additional complimentary registration to a future WVC annual conference, to be used within five years of graduation.